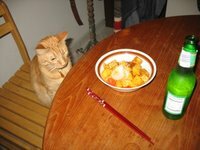 Sweet and sour pork was one of the first Chinese recipes I'd ever tried to make — wonton soup and scrambled eggs with ketchup and green onions being foods I'd made previous to that. It made me realize that Chinese cooking is not all that difficult and led me to other yummy, "homestyle" dishes such as long-life noodle soup, tomato beef chow mein, and pan-fried prawns in ketchup sauce. I realize that, for a lot of people, it's much easier just to order take-out from a nearby Chinese restaurant — but, like with all home-cooking, I like being able to control what ingredients go into my meals, and I like having the satisfaction in knowing I can make something that most people wouldn't even bother to cook. One of the families I work for is spending the day today with the grandparents to celebrate Chinese lunar new year, and then I'm watching the kids while the parents celebrate Tet, the Vietnamese new year, with Andrea Nguyen, who is cooking up a delicious-sounding meal. (What I wouldn't give to be there, too!) Perhaps tomorrow I'll go with the Anthropolgist to the Golden Buddha, a slightly fancier Chinese restaurant that I haven't been to a long time but which is absolutely delicious. 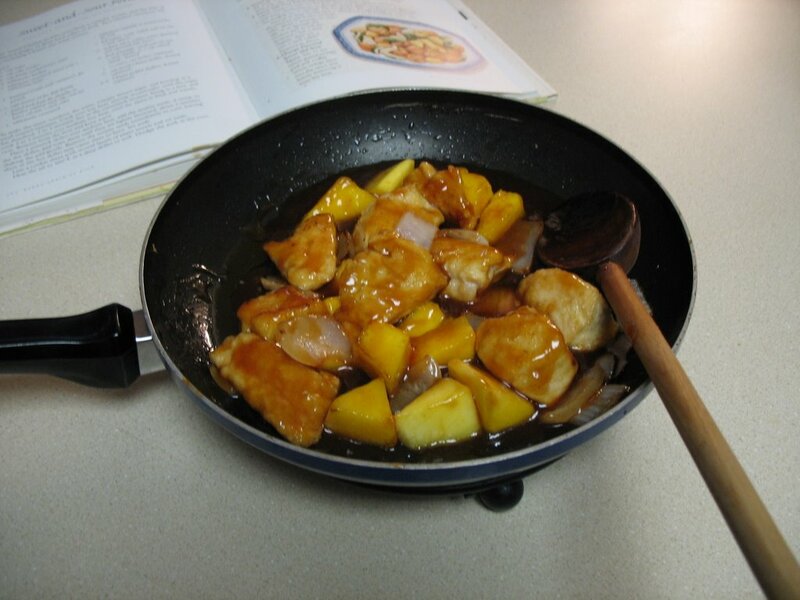 Or I'll make my favorite sweet and sour, trying the sauce over fried fish this time for a little twist. To make the sauce, combine the first four ingredients (through ketchup) in a small non-aluminum pan. Cook over low heat, stirring occasionally, until the sugar dissolves, 3 to 4 minutes. Stir in the cornstarch mixture, bring to a boil, and cook over medium-low heat until the sauce is thick. Turn down heat to very low and keep warm. Heat about an inch of oil in a deep skillet (I use cast iron). Dredge the pork (or whatever) in the cornstarch, then divide into three batches. Put the pieces from the first batch into the oil (if you try to put too many into the pan at once, the meat will be crowded and won't become crispy). Cook 4 to 5 minutes, until browned, turning to brown evenly. Cut through one piece to test for doneness; it should be white and opaque. Remove the meat and let drain on a cookie sheet lined wth paper towels. Repeat with the next two batches. In another pan, heat a tablespoon of oil. Add the pepper and the onion and stir-fry until the onion is wilted and transparent, 4 to 5 minutes. Add the meat and pineapple (or mango) and heat through for a couple minutes. Add the sauce and cook 1 minute longer. Note: If you use tofu, be sure to drain it really well by pressing it between two plates and weighting it down, like with a heavy book or a large can, for several minutes. Water-logged tofu won't fry well. Oooh, sweet n sour pork sounds crazy tasty right now. To address your concern about the meat: when you make your reservations, you can say that Lauren wants the vegetarian menu. If I remember correctly, I was still able to choose between the regular and vegetarian menu items when I got there, but that way they'll have it for her if need be. This is very important -- or at least it was for our enjoyment -- for every bite of the main course, make sure that you get a little taste of each of the elements of the dish. For us, it became apparent that the strength of the cooking was in the combination of tastes. Taken by themselves, none of the elements was particularly delicious. This actually makes sense since Alice Waters is supposed to be all about using simple, pure, fresh ingredients. Garrett - I'm always craving sweet and sour pork. Karen - Thanks for the tips!